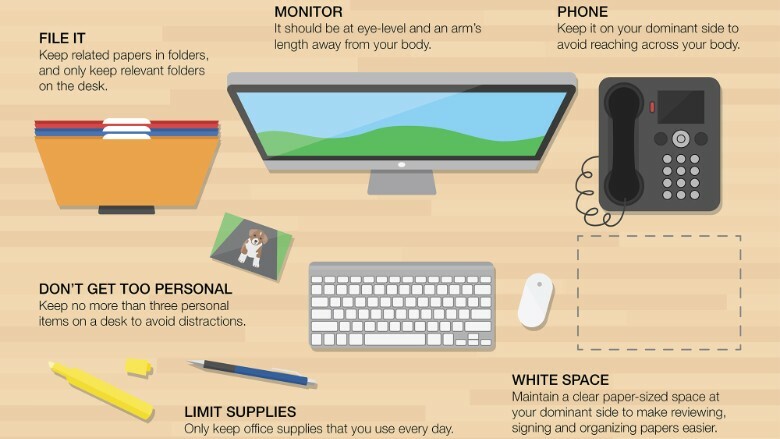 In the office, your desk is your command center. And experts said how well it's organized can help set the tone and productivity level at work. "Surveys show the average person loses an hour a day to disorganization," said Lisa Zaslow, a professional organizer in New York City. "It takes much less time to get and stayed organized. Think about how frantic and stressed you are when you can't find something." Get your layout right. Your monitor should be in front of you at eye-level and about 17-inches from your body, according to Zaslow. Put frequently-used items, like the phone or supplies, on your dominant side to avoid having to reach across. Mind your office supplies. Supplies used every day can go on the desk. Items used a couple times a week should go in a drawer under or to the side of a desk. "Getting up even just once a day for a pencil or paper clip is shutting your brain off a project you are working on and you will have to come back and re-center," said Amy Trager, a professional organizer in Chicago. It's also best to group like items together. "All your office supplies should be kept together, not split up in multiple drawers," said Andrew Mellen, a professional organizer. Go easy on reminders. When it comes to sticky notes, moderation is key. Framing your monitor with notes isn't the most effective. "They've lost their usefulness at that point," said Trager. Use them for important short-term reminders. Don't go overboard with personal knick-knacks. Maintaining work-life balance is hard, especially on your desk. Family pictures, vacation souvenirs and other trinkets can provide positive feelings during the work day, but too many mementos can be a distraction. "Our eyes pull every single thing in front of us and our brain processes it -- even if we don't realize it," explained Zaslow. A desk full of stuff means "that is a lot of work and editing for you." She recommended keeping no more than three personal items on a desk. Control your inbox. E-mail is a convenient way to communicate, but it can also be a major distraction. If it becomes too much of a distraction, Trager recommended designating certain time periods throughout the day to check and respond to email. "The rest of the time is for work." Also, don't be afraid to disable the pop-up notices of new mail if it interrupts work flow. Embrace white space. Keep a paper-sized free space to your dominant side as a designated work space to make it easier to review or sign documents. Prioritize your work flow. Only keep relevant and active projects and documents on your desk. She added vertical file holders help avoid stacking folders on top of each other and overlooking the ones not on top. Reassess frequently. Keeping a desk organized requires frequent upkeep and assessments, so be sure to take a weekly scan of your desk to make sure everything still deserves a spot on your work space. "People don't even seen [the clutter], it has an impact but they are de-sensitized to it," said Mellen.